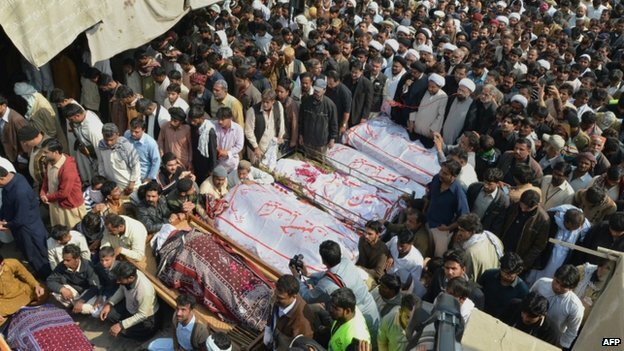 JNN 31 Jan 2015 Karachi : At least 61 people were Martyred in a Suicide Blast at a crowded Shi’ite Jama Masjid Karbala e Maula in Pakistan during Friday prayers, the latest sectarian attack on the Shia Population of Pakistan , 2nd in the Year 2015 . Police said the blast was caused by a suicide bomber when the mosque was at its fullest on Friday afternoon in the center of Shikarpur, a city in Pakistan’s southern province of Sindh. Earlier this month, six people were killed and 17 wounded by a suicide bomber outside a Shi’ite mosque in the city of Rawalpindi, while a Milad on the Birthday of the Holy Prophet was in the Process. In chaotic scenes that followed the blast, part of the mosque collapsed after the explosion, burying some of the wounded under rubble. Bystanders pulled people from the debris and piled them into Private cars and even on Tricycle Rickshaws , as the City Administration had a shortage of Ambulances , and even Medical facilities , due to which the casualty No. has risen , as Many of the injured were shifted to other nearby city hospitals. Locals said there were not enough ambulances and the army later sent additional vehicles to transport people to hospitals. The atmosphere was tense in Shikarpur after the explosion, with shops boarded up and crowds of emotional residents massing outside hospitals. “The entire city is in lockdown and there was tension in the air. There is a heavy police presence and the Rangers was patrolling the city,” said Pariyal Marri, a local resident. Radical Wahabi Takfiri Group , Jundullah an Off shoot of Tehrik e Taliban Pakistan (TTP) , have claimed the responsibility of the Suicide Blast , they are working against the Preaching of Islam , As Islam is a Religion of Peace & Patience , while these Radicals are terrorists and always try to Impose their Ideas on the other People , but still call themselves Muslims , at the same time call all the other sects , except their own created Mythology , which they call Islam, while Shiite Population is the Highest Target of these terrorist groups , who are created and sponsored by the Saudi Arabian Monarchy. “Our target was the Shia mosque … They are our enemies,” said Fahad Marwat, a Jundullah spokesman. He did not elaborate. Jafria Alliance Pakistan Chief Allama Abbas Kumaili in a Huriedly called Press Conference Deeply condemned the Barbaric act , and declared 3 Days of Mourning Nationwide , at the same time gave a call for a Shutter Down Protest in the Province , He further Put the complete responsibility of the tragic Incident on the Inept Sind Govt , and demanded that as the Democratic Govts have repeated failed to provide Protection to the Citizens of Pakistan , and specially Shiite Community .Speaking at the Conference Mr. Ali Hussain representative of Majlis Wahdat-e-Muslimeen, also Pressed for the demand of Imposition of Martial Law and showed his full support in the Chief of Army Staff , General Raheel Shareef , and demanded his interference , on the same pattern as they have even successfully restored Law and Order in Swat and North Waziristan , which were the Most troubled areas , Not Long time ago , but now the same areas are Peaceful . The Muttahida Qaumi Movement (MQM) have also given their support to the MWM’s call for a day of mourning. Sindh Chief Minister Qaim Ali Shah also announced a day of mourning for the victims of the blast. As the JAP , which was is an Umberella Organisation of all the Major Shiite Parties, which includes , Majlis e Wahdat e Muslimeen ( MWM ) , Imamia Students Organisation (ISO) , Shia Action Committee ( SAC ) , Jafria Scouts Rabta Council , Imamia Medics , Ali Council , Hiyaat e Aima e Masaajid , Majlis Zakireen e Imamia , Under the Leadership of Allama Abbas Kumaili did it best to Press on the Govt to Airlift 14 Critically Injured in the Blast to Karachi , so they can get the Best of Medical Teatment , while due to the Joint efforts and Unity among the Shia Ranks , Even the other Demand of JAP of Raising the compensation amount from Rs.500,000/- to Rs.2 Million and Rs.200,000/- to the injured was accepted and announced by the Sindh Govt , which will even compensate upto a level the families of the Victims of Blast . The attack came as Pakistan tries to adopt new measures to tackle the menace created by Wahabi takfiri terrorists following a massacre of 134 children last month at an army-run school in the northwestern city of Peshawar. On which whole of the Nation took a United stand to take decisive action against these terrorists , but as the time is passing the Party’s which are sponsors of these elements and the others who have even soft corner for these terrorist Outfits , have now started to create obstacle in the way of the Army , which is at the Moment , working hard to Mend their Previous Mistakes , and to cleanse the Nation from these Rogue elements. As the nation Bleeds and mourns Friday’s deadly blast on Shikarpur’s Masjid-o-Imambargah Karbala-i-Moulla that killed at least 60 people, Station House Officer (SHO) Lakhi Gate Bashir Ahmed Khokar and the head constable have been suspended for showing negligence in performing their duties. Additionally, constable Javed who had been designated the security of the imambargah has been arrested. Businesses in almost all major cities of Sindh remained closed early on Saturday while sit-ins to protest the government’s failure to afford protection to members of the Shia community were organised in Karachi & Across Sindh . A mass funeral of the victims was organized at 11.00a.m on Saturday morning. Police officials said the suicide jacket had been filled with ball bearings, the use of which is aimed at magnifying the impact of the blast. The investigation has moreover revealed that the explosive material used in the blast weighed five to seven kilograms. The Military Establishment has pledged to crack down on all Terrorist groups, and in this regard the Moratorium on the death penalty was also lifted , set by the Previous Zardari Govt for their Personal Interests , And in the same Line of action , on the Behest of the Establishment , the constitution was even amended for the setting up of military courts to speed convictions and widen its military campaign in lawless tribal areas. Yet Pakistan’s religious minorities, among them Ahmadis, Christians and Hindus, say the government is doing little to alleviate their daily struggle against humiliation, discrimination and violence. Shi’ites make up about a fifth of Pakistan’s mainly Sunni population of around 180 million. More than 800 Shi’ites have been killed in attacks since the beginning of 2012, according to Human Rights Watch. This entry was posted in Asia Pacific, Pakistan News and tagged Imambargah Karbala e Moala, Juma prayers, pakistan, Pakistan Chief Allama Abbas Kumaili, Shia Population of Pakistan, Shiite Mosque, Shikarpur, Sindh, Suicide Blast. Bookmark the permalink. Murdered in cold blood in the House of Allah! Could only happen in the wahabi bandit republic of pakistan.